Receipt booklet and corresponding stubs printed in offset lithography on 80# Cougar Natural white paper, containing 20 sheets, the recto printed in French, the verso in English (receipt only), perforated between the stub and receipt, the orange cover in 80# Cougar natural paper, perfect bound and stapled, each stub and both receipts, recto and verso, consecutively crash-numbered, designed by Mike Bidlo and Donald Taglialatella after the original recipt booklet used by Piero Manzoni from 1961-62, printed by Yelding Printing, Naugatuck, Connecticut, published by World House Editions, Middlebury, Connecticut. 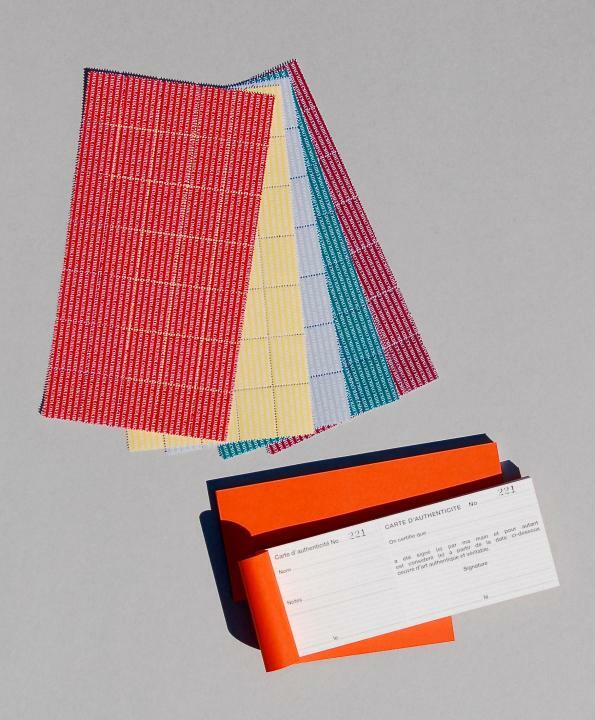 Accompanied by individual sheets of gum-based perforated stamps, each sheet printed in Archival Pigment Inks, consisting of 5 different colored stamps - red (#1797), yellow (#123), green (#342), burgundy (#202) and grey (@40%), each stamp measuring 15/16 x 1 1/4 inches (2.381 x 3.175 cm), designed by Mike Bidlo and Donald Taglialatella after the original stamps used by Piero Manzoni in 1961-62, printed by Yelding Printing, Naugatuck, Connecticut, published by World House Editions, Middlebury, Connecticut. The receipt booklet and stamps created and used in conjunction with the re-enactment of Piero Manzoni's Carta d'autenticita by Mike Bidlo on 04 November 2015 at the opening night gala of the 2015 IFPDA Print Fair in New York and which took place at the stand of World House Editions, where Mike Bidlo signed various individuals and designated them “Living Sculptures” as Piero Manzoni had done to 73 random people in various cities between 1961-62. Between January, 1961 and June, 1962, the Italian conceptual artist, Piero Manzoni (1933-1963) signed 73 random individuals at various gallery openings and events between Milan, Copenhagen, Berlin, Brussels and other cities, declaring them “Living Sculptures” and issuing those he signed a “carta d’autenticità” or “certificate of authenticity” even signing himself on 08 April 1961. 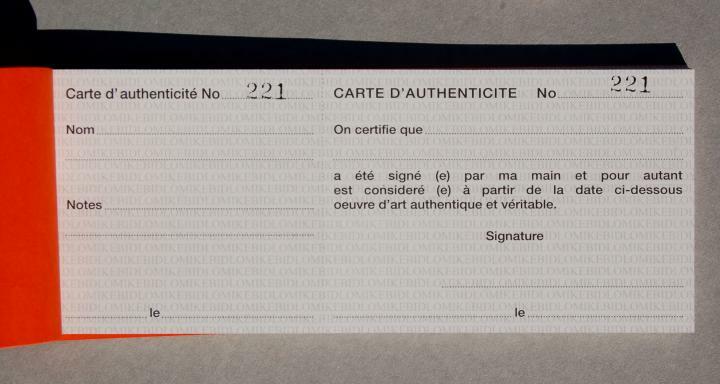 The certificates and corresponding receipt stubs, which had been specially designed by Manzoni, were consecutively crash-numbered and had a text printed in French on the front and in English on the reverse that read “This is to certify that _______ has been signed by my hand and therefore is to be considered as an authentic work of art for all intents and purposes as of the date below.” The artistic appropriation of a real live human being is furthered by the addition of the city, date and Manzoni’s signature as well as the recording of the name of the person on the receipt stub. To truly finalize the act, one of five printed color gum-based stamps, also designed by Manzoni, was adhered to the certificate and its corresponding stub of the receipt booklet, and the respective degree to which the human body was pervaded by art was indicated by the stamp’s color. For example, a red stamp designated the person signed and named on the certificate as a work of art for the rest of their life, until death. Green stamps meant that the particular signed body part is a work of art, but only when it is in the position specified by the artist on the certificate. Burgundy meant that the entire signed person was a work of art, but unlike the others, was available for purchase. A The Duchampian gesture displayed in the “Carta d’autenticità” performance took the concept of the ready-made to another level. Whereas Manzoni did not limit himself to raising the simple found object to the level of art but rather by signing a random person Manzoni made a human being the ultimate ready-made and as such the material of his own art.